Andy Dice Davies (AKA Dice 67) is a Cheltenham based street artist that runs the town's 'Free Art Friday' page and regularly holds graffiti and street art paint jams at the Honeybourne Line tunnels that his local council have "given" him to paint and curate. The "Dice" in Andy's name is a reference to "The Dice Man", a novel published in 1971 by George Cockcroft under the pen name Luke Rhinehart. It tells the story of a psychiatrist who begins making life decisions based on the casting of dice. The Certificate of Authentication's that come with Dice Davies' artworks are in fact pages torn out of the novel which include handwritten details about each piece, and signed and dated by the artist. Andy was a tutor for 16-24 year olds with learning difficulties, and his art was born out of necessity to connect with and enable the young adults in his care to express themselves in ways that were relevant to them. Stencilling was an accessible form of art and he honed this technique with each passing year of students. As time went on, further opportunities for expression presented themselves and he was challenged to think bigger and bolder. Since then, this self-taught socio-political artist has moved onto freehand spray painting and has been invited to paint at all the major Urban Art Festivals in the country. His painting of the Pixadores graffiti gang from the favelas of Brazil was chosen as a finalist in this year’s Kutz stencil Art Awards. © If artwork shown on ArtFair is already sold or unavailable for immediate sale, we'll do our utmost to source a similar edition for you. ArtFair is a trading name of LeadFair Ltd. Co. Reg. Number 08565869. Reg. Address: Swift House, 18 Hoffmans Way, Chelmsford, Essex. CM1 1GU. Registered in England and Wales. VAT Reg. No. 169725662. Registered with the Information Commissioner's Office: Data Protection Reg. No. ZA025012. Artwork prices can go up or down. ArtFair offers fine art, contemporary art, urban art, pop art, and modern art through our own collection and our global network of art gallery partners, art dealers and private collections. 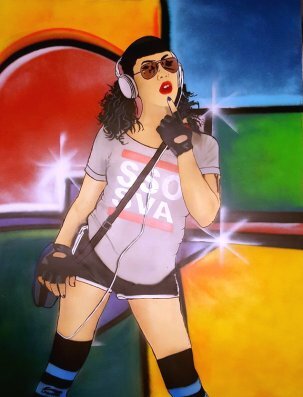 Keywords: Andy Dice Davies Art For Sale, Diceman, Dice 67, Dice Sixtyseven, Roller Girl, Dicey, Bomb Girl, Disco Girl.